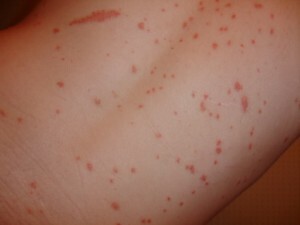 This is a form of psoriasis that is characterized by many small scaly plaques that affect most of the body. “Gutta” is a Latin word that means tear drop. Guttate psoriasis makes the skin look like a shower of red, scaly tear drops fell on it. The lesions are normally concentrated around the trunk, upper arms and thighs. The face, scalp and ears are also affected but in these areas, the lesions may be faint and quickly disappear. On occasion, there are only a few scattered lesions in total covering the body. Its diagnosis is made by the combination of family history, the clinical appearance of the rash as well as the evidence of a preceding infection. The rashes come on quickly, usually within a few days, and may follow a throat streptococcal infection. It tends to affect young adults and children more but has a good chance of spontaneously clearing out completely. Guttate psoriasis is somewhat of a relatively rare form of psoriasis. It is usually seen in people younger than the age of 30. The disease develops quite suddenly, but often times after an infection and most notably infections of the throat. However, it isn’t contagious and thus cannot be passed onto other people. Psoriasis seems to be passed down through the family and specialists think that it occurs when the body’s immune system mistakes its own healthy cells for harmful substances. Streptococcal infections. Up to 80% of the people who have this type of psoriasis also have a streptococcal infection. This usually occurs as tonsillo-pharyngitis, before an outbreak. Take note that even though the connections between the outbreaks and infections have been known for quite a while, the exact trigger mechanisms for the lesions still remain unknown. Symptoms of guttate psoriasis include itching and spots on the skin which are pink-red in color and look like tear drops. The spots may also be covered with silver, flaky skin known as scales. The spots normally appear on the legs, arms and middle of the body but may appear in other areas as well. You doctor will analyze your skin and make a diagnosis based on what the spots look like. Often times, a person with this type of psoriasis has recently had a sore throat or an upper respiratory infection. The tests to confirm the doctor’s diagnosis include a throat culture and skin biopsy. You should contact a doctor if you have the symptoms of psoriasis. You may not be able to prevent it but complications and further flare-ups can be decreased by simply avoiding anything that triggers an outbreak. For instance, anyone affected by psoriasis should try and avoid all sorts of skin trauma which can lead to lesions on the previously unaffected regions. This is also called the Koebner phenomenon. The connection between guttate psoriasis and streptococcal infections can’t be overemphasized. Prescription medicines containing vitamin A (retinoid) or vitamin D, moisturizers, cortisone (an anti-itch and anti-inflammatory) cream, lotions that contain coal tar and over the counter or prescription dandruff shampoos. Persons with very severe forms of this psoriasis may receive medicines to suppress the body’s immune response. These medicines include cyclosporine, corticosteroids and methotrexate. The sunlight may also help you to suppress the symptoms. However, be careful not to get any sunburn. Some people choose to go for phototherapy sessions. Phototherapy is a medical procedure where the skin is exposed to ultraviolet (UV) rays. It may be used alone or in conjunction with drugs that make the skin sensitive to light. Doctors may prescribe antibiotics when the psoriasis is connected to an infection. The antibiotics chosen normally fight against a number of bacteria. Always tell the doctor the drugs you are taking currently because of the real chance of a drug reaction occurring. Penicillin VK is used in the treatment of bacterial infections. The normal dosage is one tablet each day taken orally for 10-14 days. However, if you have an allergy to penicillin you shouldn’t take the drug. Take caution with the dosage if you have reduced kidney function. Erythromycin is used in inflammation reduction as well as in treating bacterial infections. The normal dosage is one tablet a day taken orally for 7-14 days. an allergy to erythromycin or liver problems, stay away from this drug. Stop taking it if you experience nausea, fatigue, vomiting, fever or intestinal cramping. Rifampin is given to people who have developed resistant streptococcal infections. If the doctor thinks that its likely your infection will last a long time and that it may turn chronic, you may be given this drug. It is usually administered together with penicillin or erythromycin and is orally taken over a five day course. Take note that there may be an allergic reaction to an antibiotic you use like penicillin. Cease taking the drugs immediately if you suspect an allergic reaction. Patients with penicillin sensitivity generally tend to do much better when put on erythromycin. For streptococcal infections, cephalosporin (antibiotic) does well but some sensitivity with penicillin has been documented. Guttate psoriasis may clear after treatment. In some cases, it may become chronic or worsen to the more common psoriasis type, plaque-type psoriasis. The possible complications associated with guttate psoriasis include; pain, severe itching and secondary skin infections.